A new feature launched today on the redesigned Peterson-Kaiser Health System Tracker website provides quick and easy access to the latest key data measuring quality, spending, access, and outcomes in the U.S. health system. Compiled by Kaiser Family Foundation analysts in consultation with other top experts, the Health System Dashboard presents users with both a broad view of the system’s performance compared to similar countries, and a detailed look at specific indicators within the areas of health and wellbeing, quality of care, health spending, and access and affordability. A new brief on the Tracker, U.S. Health System is Performing Better, Though Still Lagging Behind Other Countries, pulls together the dashboard’s data to illustrate the current status of the U.S. health system’s performance and its progress in relation to countries that are similarly large and wealthy. It finds that the United States has improved on several measures, such as life expectancy, disease burden, and uninsured rate; but that it continues to be outperformed by other countries. Overall, the new dashboard features more than 50 measures, ranging from life expectancy to spending by diagnosis, from prices and utilization to percent of workers in high deductible health plans. Users can explore trends over time, as well as differences and disparities across demographic groups. 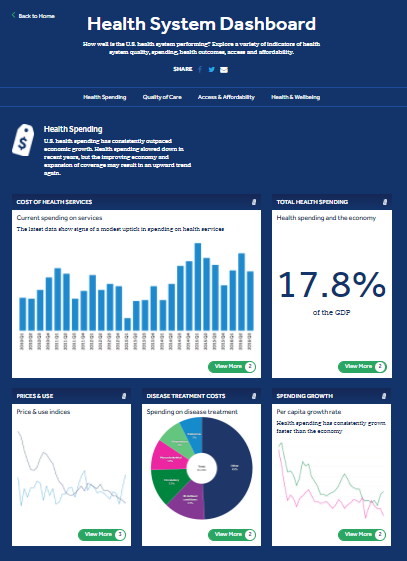 In addition to the Health System Dashboard, the redesigned Tracker includes the interactive Health Spending Explorer, the educational video Health of the Healthcare System, analyses, and dozens of collections of downloadable charts. All of the resources are sharable on Facebook and Twitter. The Tracker, a partnership between the Peterson Center on Healthcare and the Kaiser Family Foundation, was launched in 2014 to monitor the U.S. health system’s performance on key quality and cost measures.